Ronald Aufmann studied with Loren Kitt, Lawrence Bocaner, William Wright, Earl Bates, Emil Schmachtenberg and Frank Bowsher. 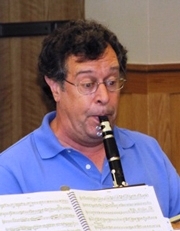 He performed with Parnassus Woodwind Quintet and Contemporary Music Forum as well as Baltimore Symphony Orchestra, Baltimore Chamber Orchestra, Washington Ballet Orchestra and Washington Opera Terrace Theater Orchestra. Currently he plays clarinet and bass clarinet with the Cincinnati Symphony Orchestra and the CSO Summer Pops Orchestra. He won the Brahms Festival Competition in Wolftrap, Virginia in 1983.